A little girl ghost haunts this Civil War-era hotel. Witnesses sayd she looks as if she had suffered from burns, and she has been seen in the rooms and the hallways. She sometimes pulls on the pant legs of men. No details of the little girl's history are known. 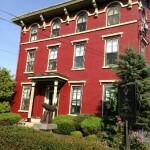 This 1758 historic inn is said to be haunted, possibly by Elizabeth Moore, a nurse who died here in 1897. Apparitions and electronic voice phenomena have been noted. Lehigh's Linderman Library is believed to haunted by the ghost of an elderly man, a deceased library patron. Some say the library is also haunted by Lucy Packer, daughter of Lehigh founder Asa Packer. 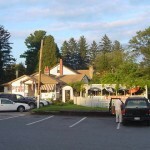 This inn is scheduled to be demolished in 2013 and is no longer open. Folks claimed it was haunted by several spirits, including Charlie, a ghost who played tricks in the kitchen by dropping silverware and moving things around. A woman, child, and Revolutionary War soldier haunted the basement. 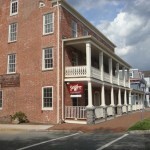 Once a 1700s courthouse, the tavern's second floor is said to be haunted by the ghost of former owner Jacob. Witnesses have described a feeling of someone behind them, objects that move on their own, and unexplained noises. 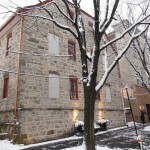 Reports say the historic 1814 hotel is currently under plans for redevelopment. Witnesses claim to have seen ghosts of small children and poltergeist activity in the building, and one person reported seeing a pair of shoes walking up a staircase. Built in the 1750s, this inn is said to be haunted by a lovely female who appears in great detail, sitting in a rocking chair in refined clothing. She also brushes past people on the stairs. 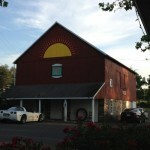 Mill runners Colonel Buckley and Mr. Black are said to haunt this inn. Look for the light from the Colonel's lantern bobbing through the halls. 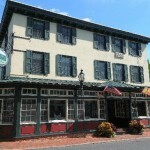 At this 1860s inn there are quite a few ghosts, according to witnesses. Odd noises and occurrences abound here; for example, in the kitchen, pots and pans may lift off their hooks and crash to the floor. Pictures also are often knocked off of the walls throughout the inn. Formerly Murphy's Crocodile Inn but now the Neshanic Inn, the 1880s building experiences electrical malfunctions and a shadowy figure in the basement. 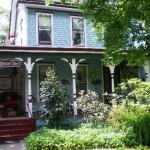 The inn is located at 102 Woodfern Rd., near the post office and the colorful train station. 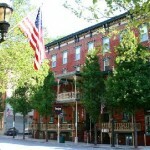 Originally the 1810 Brick Hotel, the Publick House is said to be haunted by apparitions, growling noises, cold spots, phantom perfumes, and more eerie phenomena. Legend has it that at the Old Jail Museum, a bloody handprint on one of the jail walls keeps coming back even if it is painted over. Ghost tours are offered on the premises. 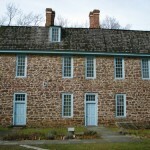 Several entities are said to be in residence here, including Elizabeth "Maggie" Graeme, a ghost that may be her husband, and a servant without a head.